Williams Lake, B.C. 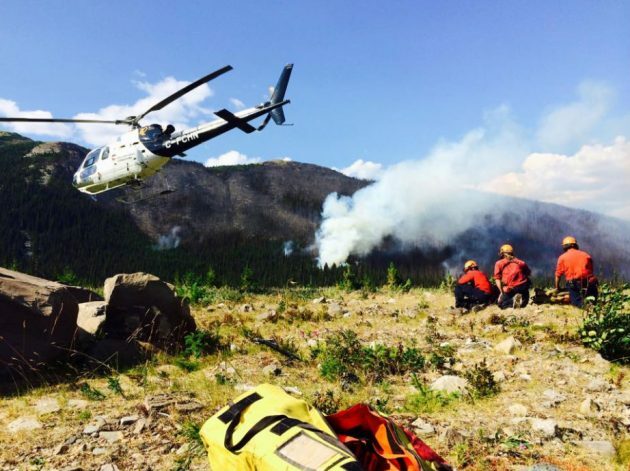 – Ever wonder what it’s like to work with the BC Wildfire Service during one of the most active wildfire seasons in British Columbia history? Predictably, fire information officer Melinda Paplawski, who’s based in Williams Lake, says it starts with long work-days. She says they stay in camps (commonly in tents where showers are also provided) and notes the number of hours worked each day varies depending on what they’re assigned to, but says many work from 8 a.m. to 8 p.m. each day. “But it is mandated by WorkSafeBC to ensure rest periods in between those shifts,” says Paplawski, who adds the typical work rotation is 14 days straight. Paplawski says this is where help from out of province and country helps. She says duties range from working on initial attack crews to building fire guards, cleaning up trees when they’ve been knocked down and more. Paplawski adds what’s made this year especially challenging is the number of interface fires (fires that threaten structures and communities) they’re battling. She estimates there are hundreds of staff stretched throughout the region – from 100 Mile House through to Quesnel. So, what keeps them going? « Previous story: Mounties Not Horsing Around! So why isn’t the military involved? It’s been at least 10 days now since the military was first involved. They’re not trained as front line fire fighters so don’t expect boots on the ground fighting the fires. I think the Military are basing out of Kelowna, they’ve got a Griffon and Chinook for evacs. They have been assisting west of Williams Lake. Mars would be nice, but the only one available I believe is down for maintenance, not available til August. Saw one of those 500 ft. up doing 40 mph over Gibson’s years ago hitting a fire on Elphinstone, they are HUGE!, but yeah different terrain.These new super scoopers are something to watch, saw them out at the airport the other day. They’re CL 215 or 415’s. Build a bridge and get over it big boy.